McDonalds is known for serving up some of the most processed, most fake Fast Food there is. I have always felt that their pies scream this fact. There is no way that you are getting two good pieces of pie for only $1. No way. Sorry. Not going to happen. Because of this fact (and the fact that I just don’t really dig McDonalds), I have never in the past tried one of their pies. 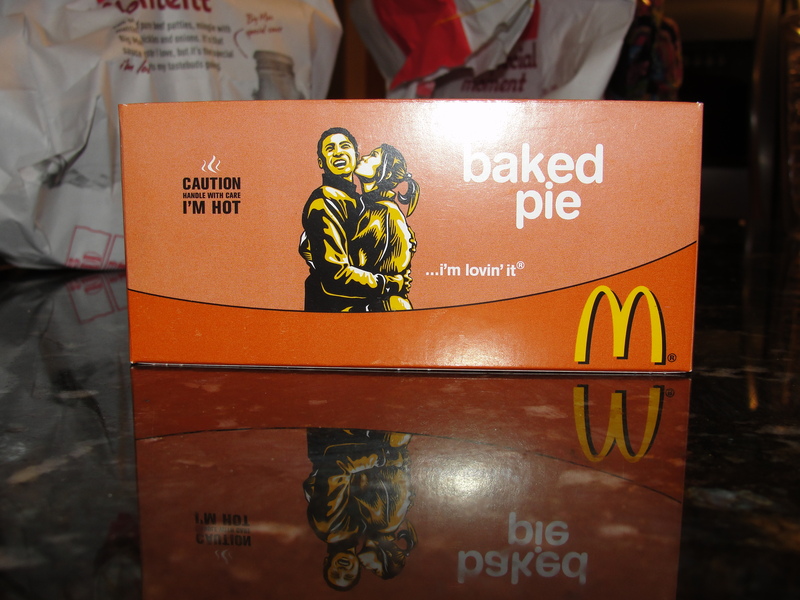 From the other food blogs that I read, I see that McDonalds offers different seasonal pies. I don’t recall if I have ever seen these offerings at my local McDonalds but, came across the Holiday Pie while in Blairsville. We drove by McDonalds after dinner one evening to get a coffee. While in line, my grandfather decided to order some Holiday Pies. After some confusion with the McDonalds staff, we ended up with 6 of these suckers. I decided that I might as well try one out so I could review it for my loyal followers. I am somewhat disappointed to say that I think I may have actually, quite possibly, enjoyed this Holiday Pie. Every healthy bone in my body says I shouldn’t have but, I think I did. The Holiday Pie is served up warm and in the signature pie box. At first look, the Holiday Pie resembles a sugar cookie with colorful sprinkles baked right in. 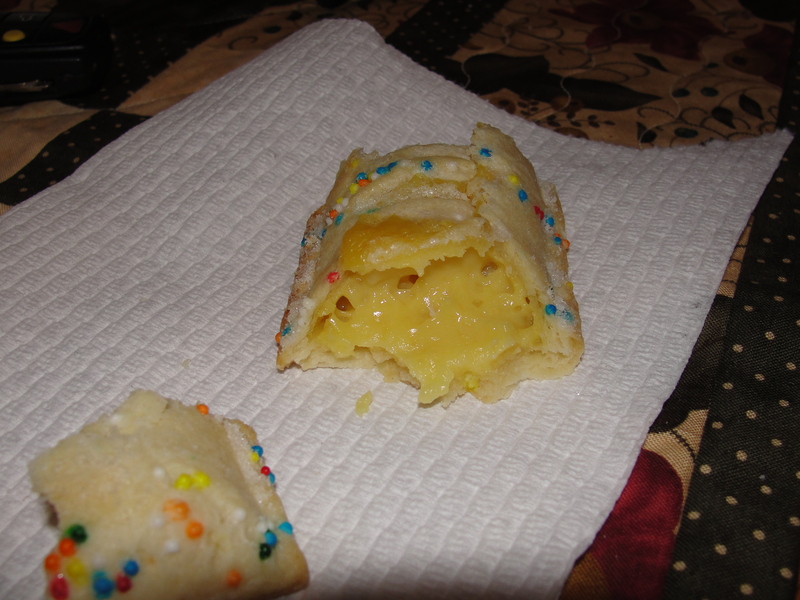 I broke the Holiday Pie in half and found that the outside was baked while the inside seemed to have a gooey center. The Holiday Pie had scents of sugar cookies and yellow cake and I was somewhat giddy in anticipation of trying not only my first McDonalds pie but my first Holiday Pie. I broke a bite size piece off for my first bite and began to chew. The baked shell mixed well with the soft, gooey center of the pie. 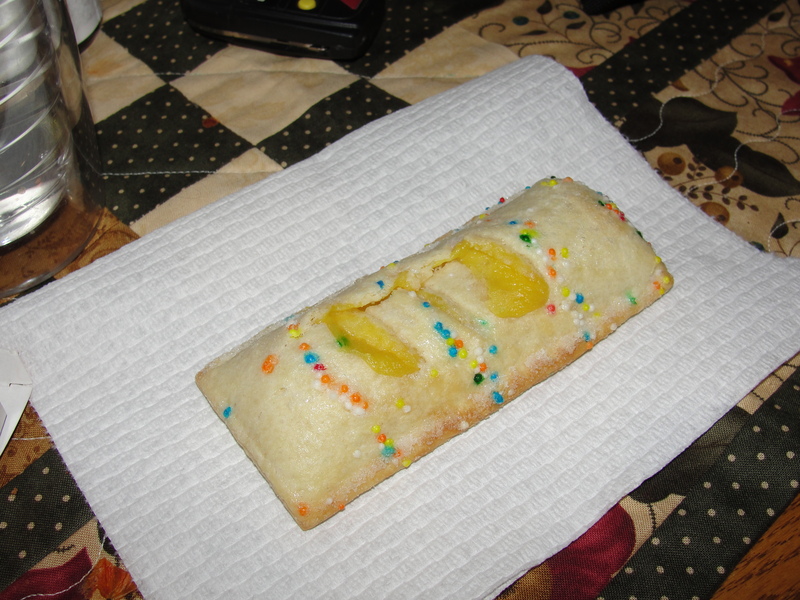 Overall, the taste was much closer to an extremely processed yellow cake then an extremely processed sugar cookie. Fake sweetener was the most relevant flavor in the bite of pie. I felt like I needed more so I continued to eat. Most of the flavor of the pie comes from the gooey interior. The interior is similar to yellow cake mix before you bake it but a bit thicker. While the flavor tastes similar to yellow cake, it is 100x sweeter. I cannot properly describe just how sweet the gooey interior is. Luckily, the baked outside does not have nearly the sweet flavor and does a good job of balancing out the sweetness and giving you the processed flavor. The baked exterior does not really have any stand-out flavors on its own. I was impressed by the fact that the exterior was equally baked throughout the entire pie. It is not to the point of being crispy but there is a gentle crunch within the exterior. I don’t know if I can fairly give this an overall rating. Something must have come over me as I was eating it which made me think it was just really good. Processed Holiday Joy is the best way I can describe this Holiday Pie. Never would you think that this pie was homemade or made with real sugar. I ended up eating the entire Holiday Pie and was amazed that I was not left with any fake tastes in my mouth. I did end up with a horrible stomach ache in the end – I’m sure because I had just consumed my monthly allowance of sugar in one small Holiday Pie. All of this sugar surely influenced me while eating it because I just really enjoyed the Holiday Pie. Thinking about it now, I am kinda grossed out by it and don’t really see myself ever eating another. But for those few minutes of eating my first Holiday Pie, I was in pure bliss.